If you’re anything like me, you wasted your whole weekend watching recap videos of the first seven seasons of HBO’s hit series Game of Thrones. You probably also got lost in the maze of videos leading you to classics like Game of Thrones the Musical and other parodies. All of this, of course, in preparation for the premiere of the final season. If you have not yet sat down to watch the premiere, what are you waiting for? Call out sick. We’ll write you an absence letter for school. You got a final? Retake the class, that’s what summer semesters are for! We are talking about this right now. If you thought the first episode of this season would answer more questions than it raises, you clearly don’t know the show too well. The episode opens with Daenerys (Emilia Clarke) and Jon (Kit Harrington) riding into Winterfell with Dothraki screamers, Unsullied armies, and, of course, Tyrion and Varys making jokes. For two years I have been waiting for the reunion of Jon and Arya, and now they were both back in Winterfell. This reunion, while touching, was not the most exciting part of the episode. We’ve got dragon riders and big reveals ahead! The moment everyone has been waiting for with bated breath was the moment Jon came to realize he is not Jon at all, but Aegon Targaryen, sixth of his name and true heir to the Iron Throne. This is not so spoilery as it seems, this was information given to us at the end of season seven, but Jon and his lover-aunt still don’t know. What was thrilling was watching Jon ride a dragon, a dragon named for his father, through the North with Daenerys. The two went zipping through trees, took nose dives down cliffs, and all the while Jon was holding on for dear life. As cute of a date as it was, it seemed even the dragons were not okay with this situation. 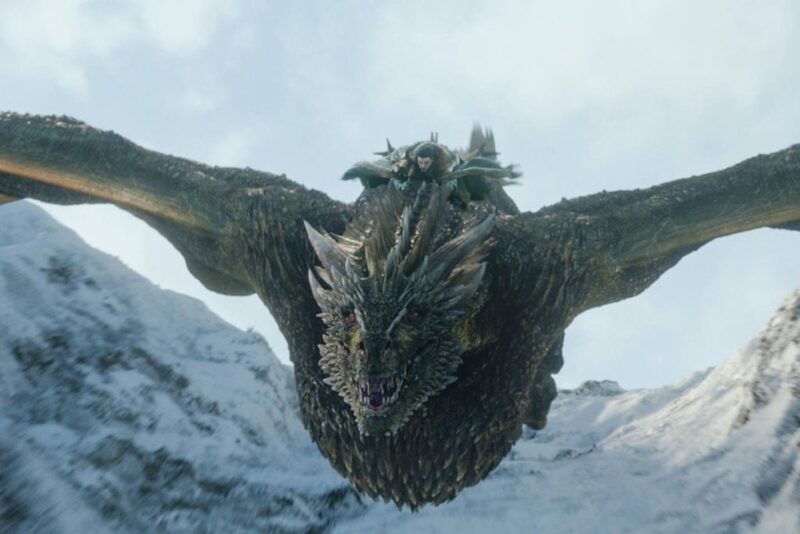 Did you see Rhaegal giving Jon that face? Before we get to the big reveal, I want to talk about all of the lovely and not-so-lovely reunions that happened last night. Sansa and Tyrion haven’t seen each other since Joffrey’s wedding and death, making the reunion quite awkward. Both of them still seem to hold each other in somewhat high regards, but the question that I need an answer to: are the two still married? Yes, Sansa did remarry an abusive monster because it was believed Tyrion was dead, so what happens now that he is alive? Jon and Bran finally reunite, but that is just a strange encounter altogether. In fact, Bran was probably the most dramatic element of the entire episode. Every time someone looked over a ledge or out a window, there was Bran “waiting for an old friend.” This leads me to best reunion of the show, the moment that doesn’t come until the very last minutes: Jamie Lannister coming face-to-face with the boy he shoved out a window in the very first episode. We’ll have to wait for next week to see how this interaction goes. We also can’t forget Theon’s rescue of his sister Yara, which was pretty awesome. One more meeting we have to discuss is that between Dany and Samwell. If you remember back to season seven, Daenerys burned Sam’s father and brother alive after they refused to bend the knee to her and her cause. This makes for an awkward encounter when Dany has to reveal this, but it leads to a very special moment in the crypts of Winterfell between Sam and Jon. Sam must reveal what she did to his family, and Jon isn’t entirely sympathetic with Sam. When Sam reveals the truth of Jon’s lineage, however, Jon doesn’t know to believe it at first. Would the honorable Ned Stark lie to him for years? Well, apparently. There isn’t enough time to gauge his reaction to the news, and we won’t know how this changes the dynamic of Jon and Dany’s relationship. This leaves us with so much to expect for next week. Not only will we get to see Jamie and Bran reunite, we will see Dany face down the man who killed her father. Or have you forgotten that Jamie is still the King Slayer? It’s so easy to forget with all of the happy reunions that there is still a major war going on. Cersei’s got a fleet of tens of thousands of men that she plans on using to betray her brothers. She even has sell-sword Bronn out to kill them. I wonder if he will, considering he was always very loyal to the two. Then again, a sell-sword is loyal only to the highest bidder. An even bigger war is on the verge between the living and the dead, and we are supposedly just a few episodes away from the major battle of Winterfell. At this point the only thing for sure is that there will be a lot to unpack in each and every one of these episodes, and they only get longer from here. We want to hear your thoughts and theories! Will Jon turn against his queen? Will Dany take revenge on Jamie? We will be here every Monday discussing each episode, so make sure you’re here to let us know what you think.